Celeste Ng grew up in Pittsburgh, Pennsylvania, and Shaker Heights, Ohio, in a family of scientists. She attended Harvard University and earned an MFA from the University of Michigan (now the Helen Zell Writers’ Program at the University of Michigan), where she won the Hopwood Award. Her fiction and essays have appeared in One Story, TriQuarterly, Bellevue Literary Review, the Kenyon Review Online, and elsewhere, and she is the recipient of the Pushcart Prize. She lives in Cambridge, Massachusetts, with her husband and son. “Quiet and intense…A family drama that reveals its secrets slowly, drawing you in." 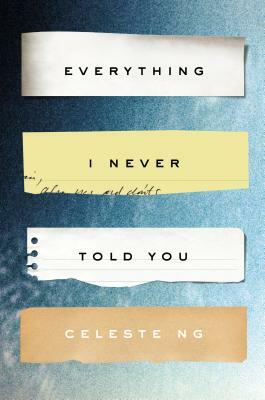 "Everything I Never Told You is a suspenseful and emotionally complex literary mystery novel, which, weaving back and forth in time, unlocks the secrets beneath the surface of family life. Celeste Ng has written a compellingly tense and moving first book." "Celeste Ng leavens the bridge between the disappearance of a young girl, and the personal histories that precede it, with the larger canvas issues of race and gender, without straying from the riveting emotional territory that make up the cornerstones of family: what is given, what is withheld, and what can never be known. Lydia Lee is every parent's dream, fear, and devastation, wholly loved, just as completely lost. It is impossible to resist grieving alongside each one of these bereft, deeply realized characters, for we live their lives, and their story becomes ours from the first paragraph of this marvelous book."